In January of this year, we brought our “furever” family member, Sophia into our home to join us and our boxer, Jack. Sophia is a rescue mixed breed dog who has brought so much joy into our lives. My children and I love working with Sophia who is now jumping through hula hoops and practicing her new tricks every day. She is such a joy and we can’t imagine our family without her in it. Therefore, we were so excited to watch the new family film, My Dog the Champion (SRP $24.98) which was recently released on DVD as a Walmart exclusive title. Starring Dora Madison Burge, Lance Henriksen and Cody Linley this adventure showcases the unlikely friendship between a teenage city girl and a cattle dog. Imagine our delight when we learned that Scout, the movie’s main star is also a rescue dog! In fact, it was produced by Arthur E. Benjamin who is the founder of the American Dog Rescue which is an all-volunteer non-profit organization to rescue dogs and animals all over the world. In this family feature, a spoiled city girl, Madison and her family move to the country to live on her grandfather’s cattle ranch she feels out of place in her new environment and overwhelmed with loneliness. She unexpectedly develops a friendship with Scout, the “useless”, old cattle dog and the pair develop a deep bond. When the family farm is threatened, Madison and Scout team up with Eli a teenage dog trainer as they dream of working together to win an agility dog competition in order to save the ranch. What I appreciate about this film the most is that it is heart-warming without being sappy and it is a family film that can be enjoyed by children and adults alike. It features themes of friendship, determination, loyalty and courage as the main characters face adversity. It is also inspirational as I overheard my seven year old daughter, Hannah whispering to Sophia at the end of this movie that they could work together to be “champions” too! With a G rating, My Dog the Champion is a wonderful family feature especially for those who love dogs. You are invited to visit Anchor Bay Entertainment to browse the entire selection of movies and home entertainment. 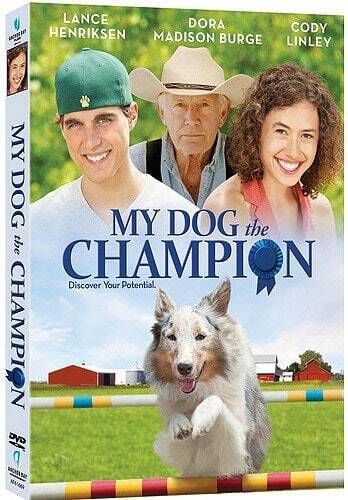 Hurry over to Walmart now to purchase My Dog the Champion on DVD which is on sale for only $12.96 which is 48% off the SRP! I love a good dog movie! This movie looks really good.